The yarn used for this project has been discontinued for many years. Any worsted or aran weight yarn will work. Use a natural fiber, if you would like to block out your drop stitches for an especially lovely project. 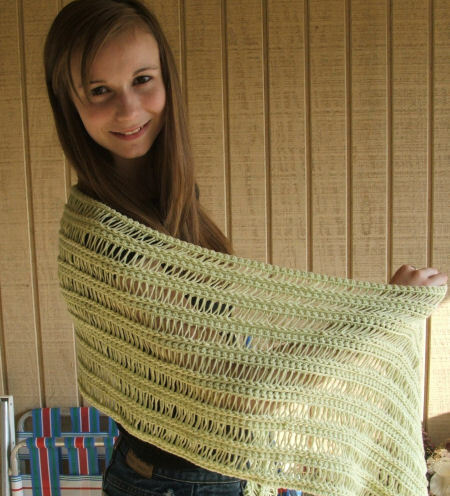 This project is worked in typical broomstick lace method, without the lacets. 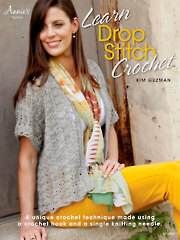 If you prefer to work in Drop Stitch Crochet, as developed in this book, it will work just as well. You can find a video for this technique on my YouTube channel here, in both right- and left-handed versions. The video below is in Drop Stitch Crochet which isn’t exactly the same as the original pattern. But, it may be useful to those making the project. Row 1: With crochet hook, ch 196, sc in second ch from hook and in each rem ch, turn–195 sc. Row 2: Ch 1, sc in front loops only, turn. Row 3: Pull up slightly on lp on hook and place it on knitting needle, sk first sc, *with knitting needle pointed in same direction as you are working, insert crochet hook into front loop of next st, yo, pull up a lp until it is large enough to place on knitting needle, rep from * across, turn–195 lps on knitting needle. Row 4: With crochet hook, sl st into first lp, ch 1, sc in top of same lp, pull lp off knitting needle, *sc in top of next lp and pull lp off knitting needle, rep from * across, turn–195 sc. Row 6: Ch 1, sc in front lps only across, turn. Rep rows 3-6 for pattern until piece measures 15″, ending with row 5, fasten off.